For The University of Hong Kong, their median marks of IB admissions for the programmes, MBBS and Dental Surgery, in the year 2017 to 2018, were 44 and 43 respectively, while the full mark is 45. Five years ago, Vanessa Lee Wing-kai was in high school, she chose to study for an International Baccalaureate Diploma, a qualification which was less known in Hong Kong at the time. "The proportion of IB to Hong Kong Diploma of Education students was about 30 to 100. There were two classes of IB students, while there were eight classes of DSE students," said Ms. Lee. In fact, she does not think studying IB made her better than any DSE students. "IB will only become an advantage if its diverse and integrative learning style suits you," said Ms. Lee. 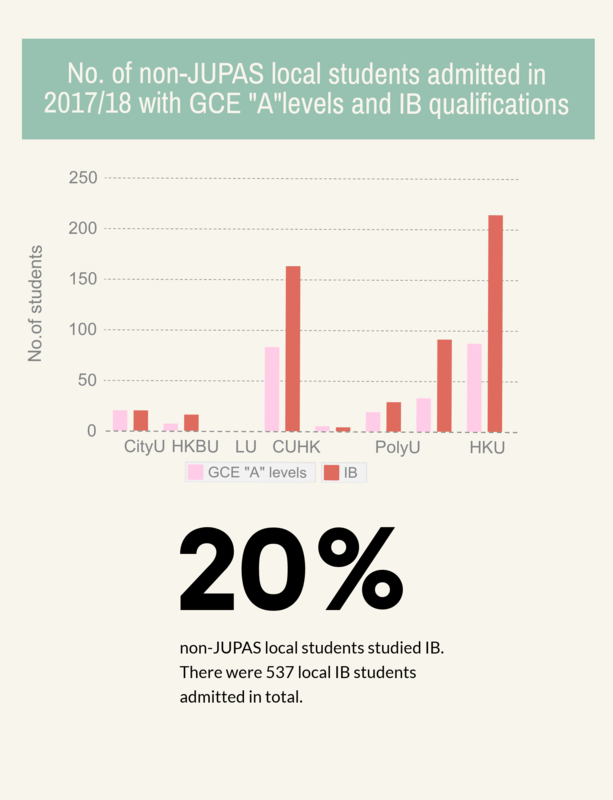 Over the past few years, the number of students admitted to universities in Hong Kong through non-JUPAS (Joint University Programmes Admissions System) programmes such as IB rose significantly. According to data provided by the University Grants Committee, those with IB diplomas increased by 4% over four years. In 2013, Gabriel Matthew Leung, Dean of the Department of Medicine at the University of Hong Kong, said in an open seminar that he hoped to take up the responsibility to ensure local DSE students their right to university education by increasing the overall departmental JUPAS admission quota to more than 75%. Previous record of JUPAS admission numbers online showed a total intake of 150 students for Bachelor of Medicine and Bachelor of Surgery programme at HKU in 2012. 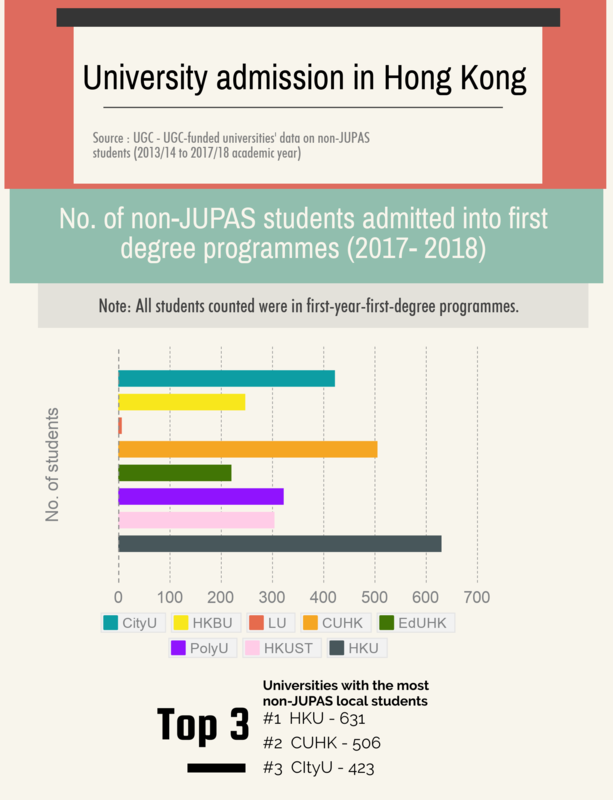 But this year, less than half of the 235 students admitted to the Bachelor of Medicine and Bachelor of Surgery programme at HKU were JUPAS high school leavers, according to data from HKU. That raised questions on whether non-JUPAS students were given an unfair advantage by Hong Kong's eight UGC-funded universities. Earlier this month, legislator Ip Kin-yuen released an official statement of reply from the Education Bureau which contained non-JUPAS student admission numbers from each UGC-funded university in the past 5 academic years. The Hong Kong Association of the Heads of Secondary Schools suggested setting up a public test score conversion system for universities as a way of comparing IB and DSE scores. Teddy Tang Chun-keung, the Acting Chairman of the Hong Kong Association of the Heads of Secondary Schools, says different programmes in universities are allowed to make their own decisions and there are no generally-liked standards on student admission at the moment. 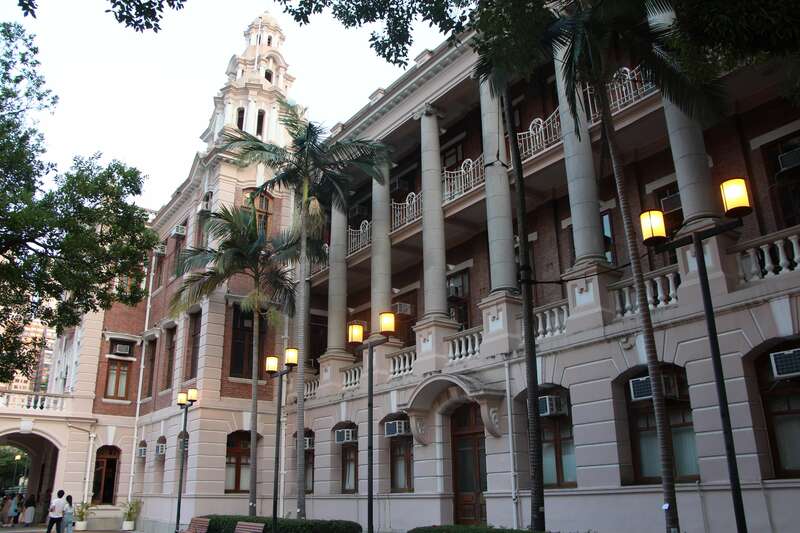 Teddy Tang Chun-keung, the acting chairman of the association, explained that the conversion system would be of public interest and would benefit the universities. "It could clear the air since it is suspected there were unfair treatments among the systems," Mr. Tang said. "It would harm the universities' credibility if things were not clear and it has intensified distrust in society." Mr. Tang emphasised the conversion system could act as a benchmark for both Hong Kong society and universities. He pointed out that the Universities and Colleges Admissions Service in the U.K could be a model of reference for the conversion system. According to the UK government's educational updates, UCAS is a "centralised" tariff point calculation system that compares various qualifications students have for university admission, including GCE A Levels, IB and HKDSE. The point system was updated in 2017. "Using a qualification's size and grading structure to calculate total tariff points", according to the online introduction of the modified system, the UCAS tariff points calculator can show the equivalence of multiple systems indicated by the points. In other words, achieving a certain grade of a subject in DSE could be equal to achieving a different grade of the same subject in IB as long as the same points were generated. Joe Hui Hon-wing, the lecturer from The Education University of Hong Kong, emphasises institutions in Hong Kong carry the freedom to incorporating the IB system to their practicum, given they have the resources to support the cost, which obviously comes from the amount the parents are willing to pay for their children to study IB. However, Joe Hui Hon-wing, a lecturer at the Education University of Hong Kong in the Department of Education Policy and Leadership, said a score conversion system would not be effective in Hong Kong. "Both systems cannot be measured simply by comparing them directly," he said. He described that IB is intended for students that take the time to explore. It contains a broader spectrum of knowledge that is to be learnt and graded, based on their performances in a diverse series of more extensive and integrated assessment. DSE, on the other hand, uses one standardised examination to conclude three years of scheduled learning on topic-based content. Ms. Lee is a former IB student from St. Paul's Co-educational College and an undergraduate in her third year in MBBS at the University of Hong Kong. "I was planning to study overseas after high school and I have been more familiar with English growing up so IB was more manageable for me," she said, "My brother studied IB too." Timothy Chiu Lok-hin, a year 4 MBBS student also at The University of Hong Kong came through JUPAS. He said he was never introduced to anything about IB in secondary school. "I was at La Salle College and they do not offer IB," he said. "I was not considering going overseas or transferring to any international schools, so IB was never in the picture." 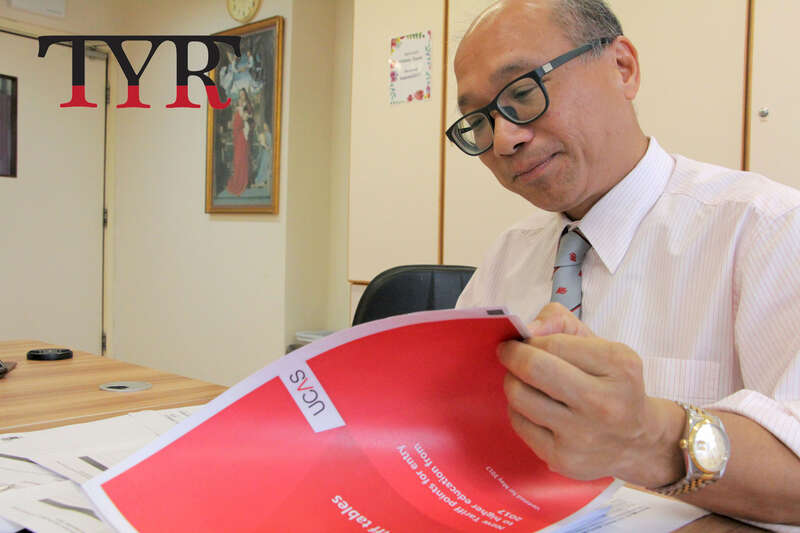 Both Ms. Lee and Mr. Chiu studied science subjects in their respective secondary schools, yet their assessments and areas of study were completely different under the two systems. Ms. Lee said IB seems to offer a more open and self-initiated learning experience. For instance, she was required to write up an extended research essay for each of the topics for Chemistry in 1000 to 2000 words. "IB focuses a lot on experiential learning," she said, "Part of your passing grade requires you to conduct either a service project or an activity which must be self-initiated and conducted outdoor. We need to write a proposal and a reflection for it." On the other hand, Mr. Chiu believed DSE is more topic-based, which focuses more on what could be learnt in books and notes. "The only assessment I did that I thought was similar to those of IB was the Independent Enquiry Study Report," he said, "Still, only a written report is concerned. Basically, there is hardly any assessment that allows students' integration of different kinds of knowledge in DSE." Despite being a scholarship recipient in secondary school, Ms Lee said she was still paying around $7,000 per month in her 2-year IB practicum. According to the Education Bureau, Ms. Lee’s Alma mater, St. Paul's Co-educational College, is currently one of the most expensive local DSS schools. Their maximum school fee per year per S5 and S6 student reaches $91,500. This implies Ms. Lee could have been paying $7,625 each month in her last two years of high school if no school scholarships had been granted. Mr. Hui, the lecturer in the Education University of Hong Kong, pointed out the Hong Kong government has never fully funded the 30 schools which have been offering the IB practicum. "IB is recognised internationally, but it is not a local system," he said. "It is impossible for our government to support any practicum running in schools that would not be an easy target of centralised control." The lecturer said it is pointless to set up a conversion system between the two exams unless they are allocated with the same amount of resources from the government, and have the same learning context and assessments.